mama elephant | design blog: Happy Thanksgiving with our special guest Mette! Happy Thanksgiving with our special guest Mette! Happy Thanksgiving! Today we have a very special treat for you! We came across this project on Facebook and Instagram and it just knocked our socks off. Within hours, Angela and I both separately picked this out! We knew we had to do a full feature of this incredible project by Mette! we reached out to Mette and asked if she would do a little write up for our blog! Thank you for sharing with us, Mette! This is truly a stunning labor of love! Hello! 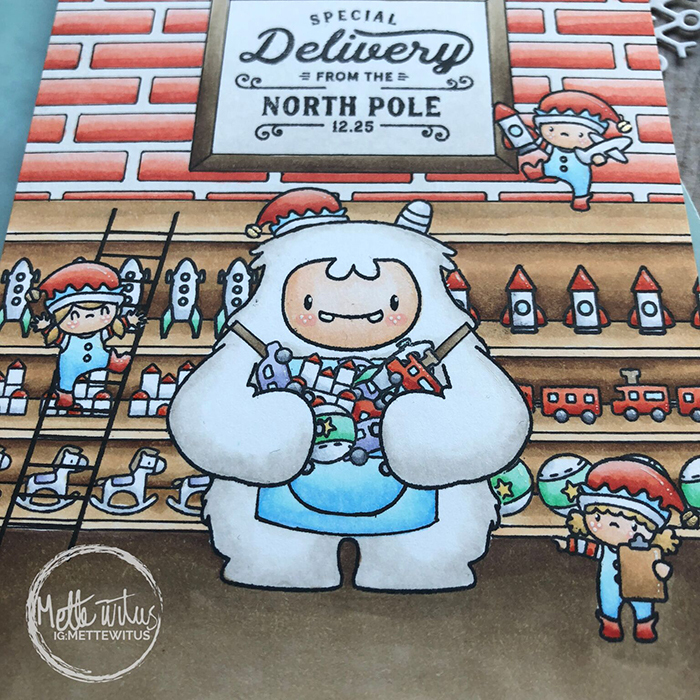 Mette Witus here, showing my Santa’s Workshop card featuring a variety of Mama Elephant stamp sets, most noticeably “Me and my Yeti”, “Little Elf Agenda” and “Retro Holiday Labels”. 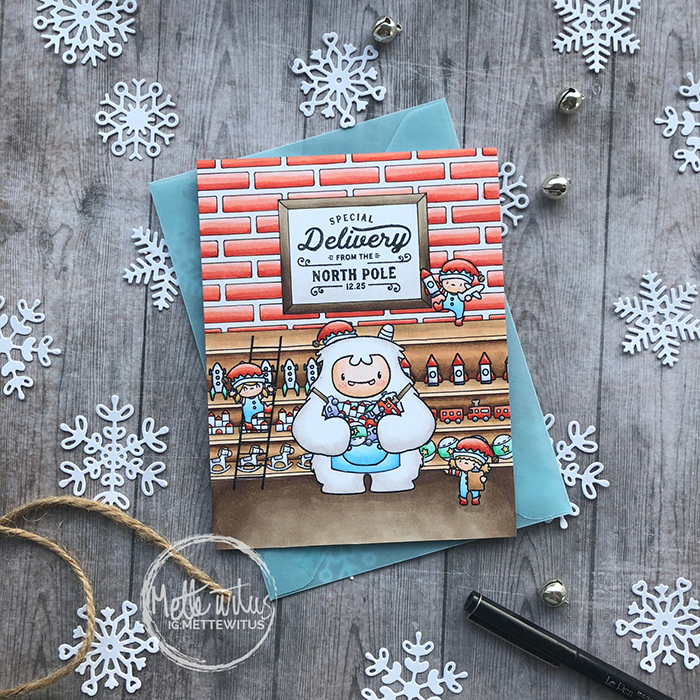 It all started with my sister presenting me with the challenge of making a card featuring these two things: Santa’s workshop and a yeti (She’s just as much in love with the Mama Elephant yeti as I am!). I began by stamping my yeti (minus one horn), elves and sentiment, giving me the most important parts of the card. To give my yeti a matching elf hat I simply masked him (minus his horn) and used one of the elves for just the hat. Knowing I wanted a full background I masked my critters and drew a frame around my sentiment with a Copic safe pen. I knew my card had to be filled with toys to give it the feeling of Santa’s Workshop , and even though the Little Elf Agenda set has a lot of those, I still didn’t have enough. Flipping through all my stamps, I finally found some space ships in the “Space Bears” set that matches the one held by the elf almost perfectly. So my Yeti would not be leaving all the work to the elves, I thought it would be cute to have him carrying all the toys. To do that I created masks just for his hands and arms and then started stamping toys one at a time, masking each one of them before stamping the next. leaving a little space between the toy and the front of the shelf. This meant I could give my shelves some depth by adding another line behind the toys to mark where the back of the bookcase is – and of course give my top elf something to stand on! To finish off the scene I grabbed my Copic safe pen again and added the last things, such as a ladder for the elf, an apron for the yeti, and of course the brick wall, which was done using a brick stencil. Now all that was left to do was remove the masks and start coloring - I used Copic markers for my card and final little highlights with a white gel pen. I hope you liked my project and thank you for taking the time to read! Here’s a little bonus look at how it looked without coloring – Very much like a Christmas coloring page! Really well done, sis! Waaaay better then I could have imagined! This is fantastic! I love the depth of the scene and the attention to detail. Adorable card! Fun details and awesome coloring! The amount of masking this required is insane!! The result is amazing, though! I love all of the details you've included in there. Everything mesh together so incredibly! Wow... thanks for sharing and inspiring! WOW ! Beyond amazing ! So glad that this was spotted as this needs face time. Thank you for sharing your inspiration & creativity.